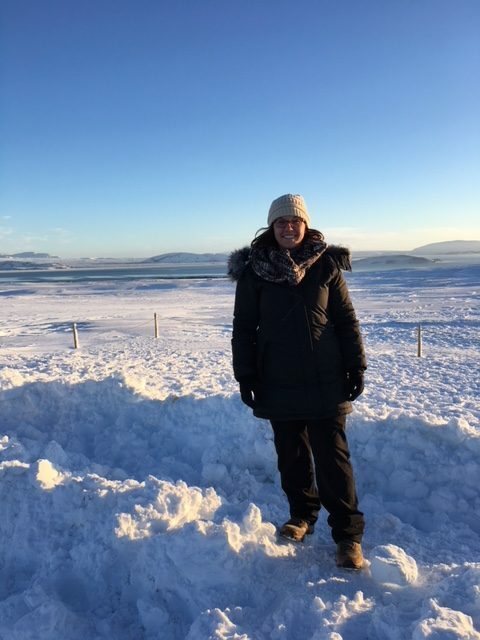 To quickly re-cap, myself along with a group of 12 others spent January 15 – 20, 2018 exploring the southern part of Iceland with G Adventures on this tour: Northern Lights and the Golden Circle. Here’s what I ended up bringing and it was 100% perfect! One pair of waterproof hiking boots. I shopped for a few months back in the summer waiting for a deal and was fortunate to grab a pair (although not fashionable) for $60 at a local shoe store! One pair of snowpants. Columbia Oulet FTW! One pair of fleece lined pants. Eddie Bauer outlet FTW – worth mentioning: we outfitted my husband for the entire trip at Eddie Bauer for less than $300-$350 – two pairs of fleece-lined pants and an entire jacket “system” meaning three layers. Three thermal tops. To be honest, I think I only wore two of them?? Long, waterproof winter jacket with a *faux* fur lined hood. I bought mine on Zulily in ’16 and I am obsessed with it! Three pairs of wool socks. This was definitely a must. Amazing waterproof gloves. Try a bunch on, find ones you think will really keep your hands warm! That was the hardest ‘thing’ to keep warm. Scarf. I brought one and was totally happy with that! Two pairs of black leggings. Both for the plane and to wear under the fleece lined pants and I wore them as ‘pants’ (gasp) under a sweater dress for a dinner. One sweater dress. Not a necessity, but I did wear it twice for dinner out. Handwarmers. As long as we got them ready before stepping out in the cold, these were a nice way to keep ourselves a bit warmer! Crampons. I’m only including this as more of a warning! We were lucky that G Adventures provided ours, but it wasn’t even something I knew existed. 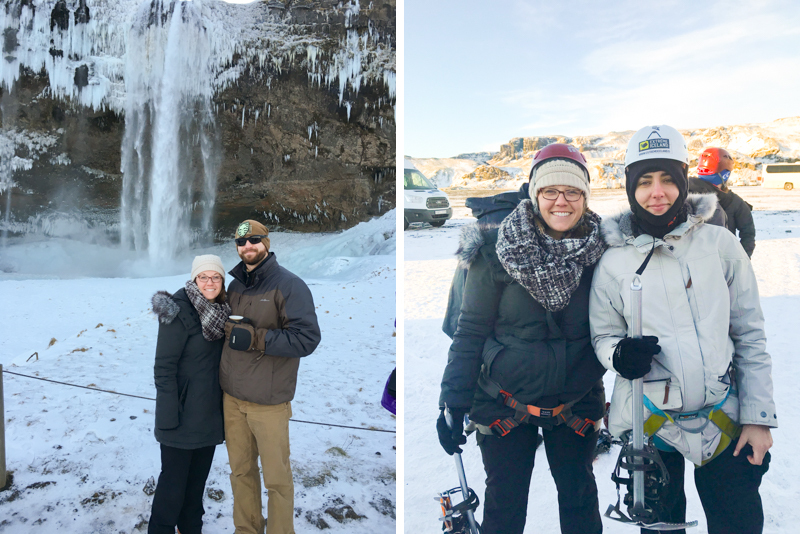 We saw so many people wearing UGG boots or improper footwear while we were visiting waterfalls and glaciers and all of us commented how happy we were to have our crampons to keep us from falling! Face/neck ‘mask’. One of those ones you pull up over the bottom half of your face would’ve been really nice. 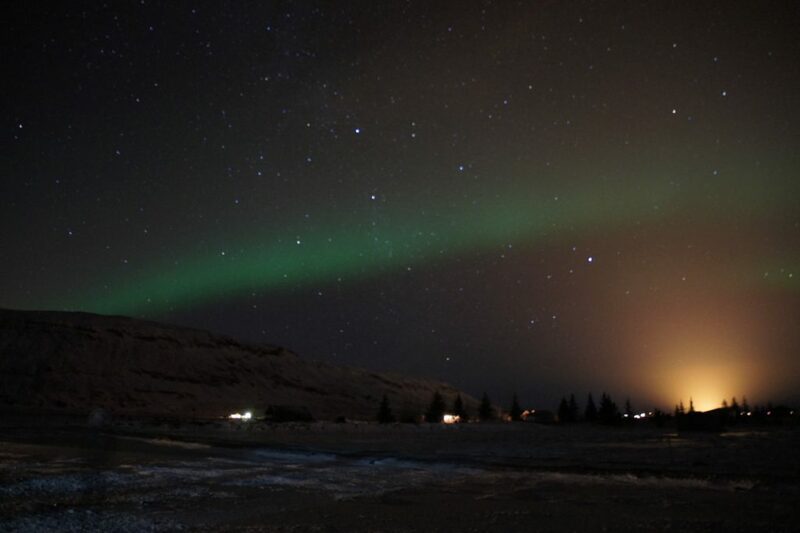 Iceland in the winter is truly magical – it’s less crowded and fresh with the white snow everywhere! I enjoyed it more than I anticipated – especially stopping into little coffee shops and being so happy our guesthouse had heated floors! If you’re up for real adventure, as I wouldn’t suggest a trip there during the winter months unless you really plan to get out there and hike a glacier, head into a lava cave buried under the snow, hike to a geo-thermal river (okay, that I would actually leave out next time haha! ), have a better shot of seeing the Northern Lights (oh boy, were they WORTH it), and getting to see what it’s like to live with fewer hours of sunlight – you gotta go! And if you want to go in the spring, summer or fall – that’s okay too. You know how to reach me to plan your adventure – start here.